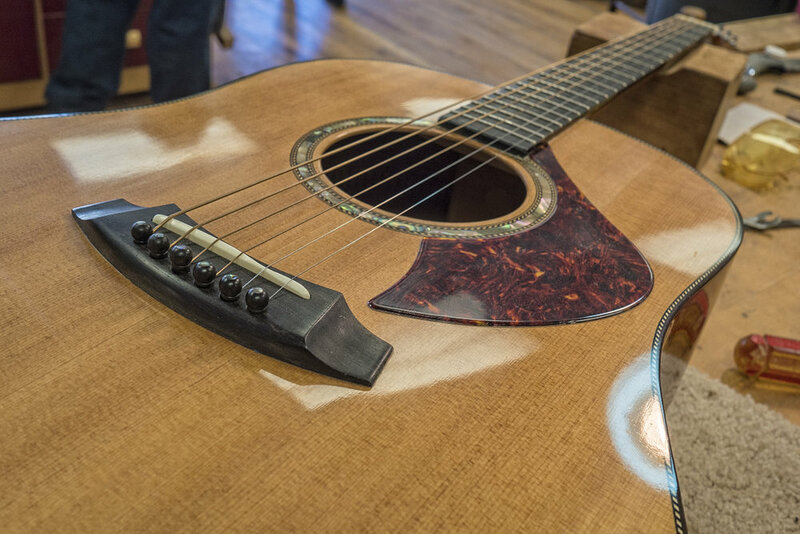 The Appalachian School of Luthiery's acoustic guitar gets its DNA from America's very best guitar makers. Combining century-old traditions with a few of our favorite modern design features, these guitars are ready to go to work. 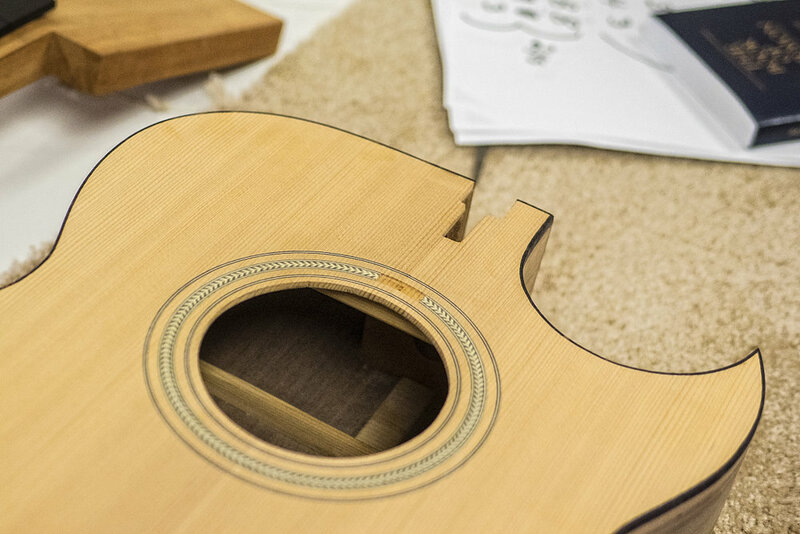 Our course is a fast-paced immersion into the world of the luthier. You quickly become one of the shop guys! The student will carve his or her own neck, bend sides, build and bind the box, fret and finish the fingerboard. The instructor will demonstrate resawing, milling, fabrication, finishing and setup techniques. We'll show you power tools and jigging, pattern-making and guitar design . . . starting with just a centerline. 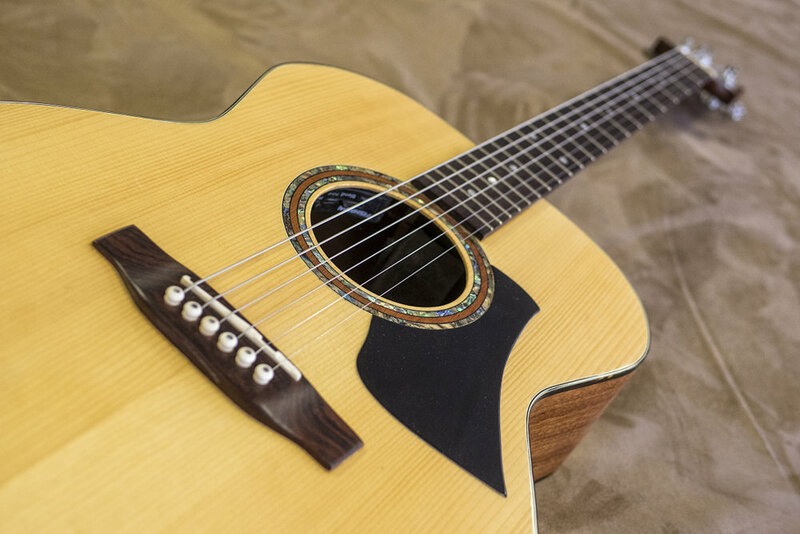 Available in slope-shouldered "Dreadnought" or a slightly-smaller "Parlor," the student may choose back and side sets from Black Walnut, Black Locust or Honduras Mahogany. We also have a good supply Tornado-Spalted Curly Maple while it lasts. We'll teach you how to apply the sealer coats of our own wiping shellac, and furnish you with enough flakes to finish the job at home, along with instruction for several viable finishing solutions. "Several years ago, I was interested in building a guitar. I got some nice wood, read everything I could on luthiery, and quickly realized I was in over my head. I asked around for advice, and was told about Doug Naselroad at the Appalachian Artisan Center. He told me he would help any way that he could, so naturally I rushed on over to Hindman, and fell in love with the luthiery shop. The Artisan Center has a world class shop with a down home feel, and I think of the guys over there as family. Doug is a world class guitar builder who wants to pass on his knowledge. If you are interested in building a stringed instrument, there’s no better place in the country than the Appalachian Artisan Center in Hindman, Ky."
Appalachian School of Luthiery, 85 West Main street, Hindman, Kentucky 41822, (606) 785-9838. Website design and major photography by Malcolm J. Wilson. Major writing by Doug Naselroad. Additional credit to the fine folks at MACED who funded this website. ©2017, Appalachian School of Luthiery, Appalachian Artisan Center, Doug Naselroad, Jessica Evans and Malcolm J. Wilson.